"Hey, Joe! We're being followed!" 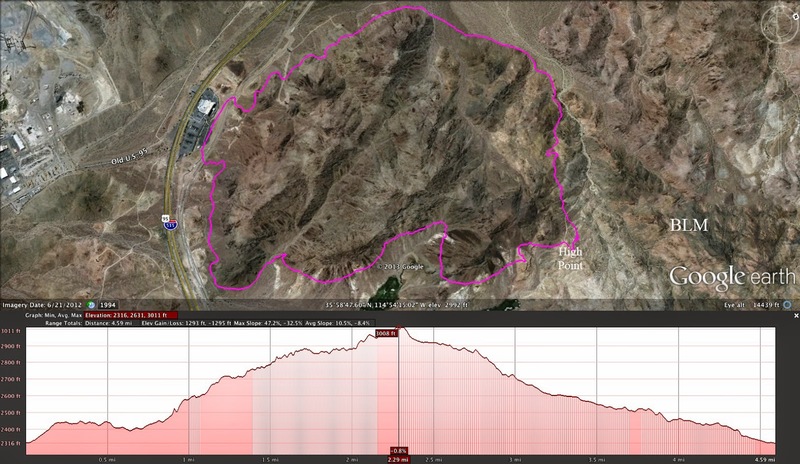 Nine hikers arrived from various points around town at the Railroad Pass Casino upper parking lot for a moderate hike on a trail around the mountains located directly behind. Most of the hikers had not hiked this loop and we were all in for an exciting morning. We began by crossing the paved River Mountains Trail and the train tracks above. From there, the trail took us on a climb up to the circling route. This was probably the hardest climb of the morning! 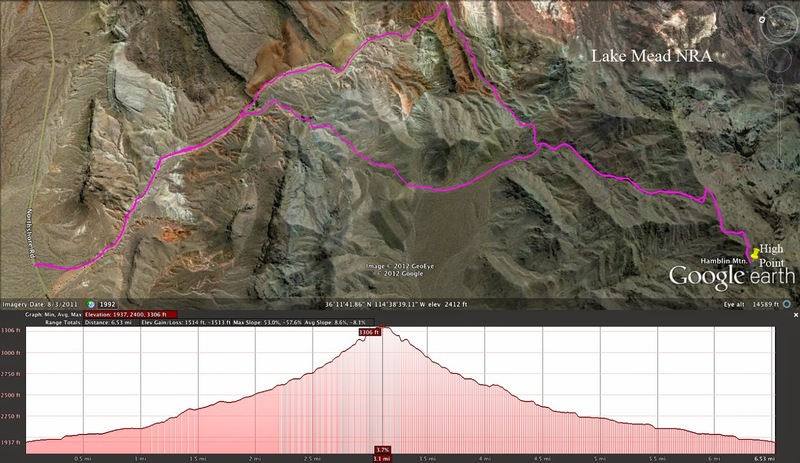 Once we were on the main trail, we turned to the right and began circling counterclockwise. It wasn't long before a hiker shouted, "They're up there!" We had all been sneaking glances up to the mountain ridge to our left looking for bighorns. And, yep, there they were! Three females. 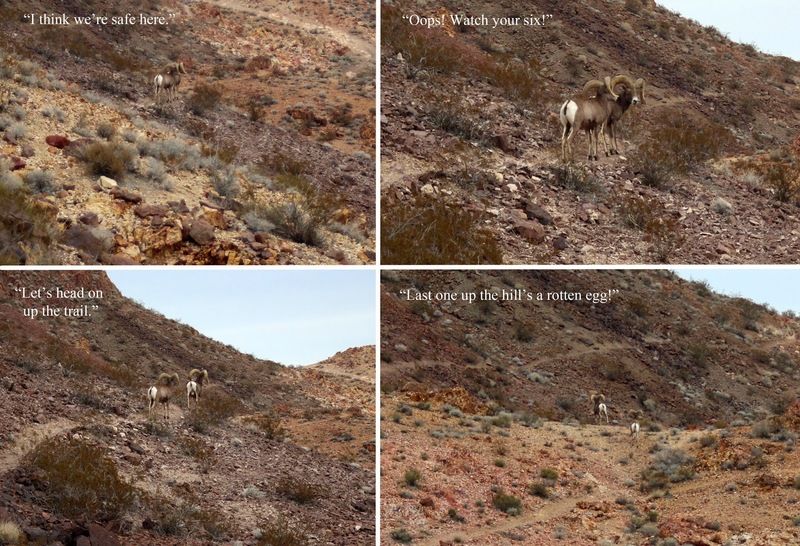 We got our fill of bighorn photos and felt quite lucky to have seen them. Then we moved on to where we could see the Cascata Golf Course clubhouse and driving range. The chilly day offered clouds and little sun so the very green grass on the golf course really brightened things up. At the next corner that the trail turned, we could see the large waterfall at the end of the driving range. Oohs and ahhs, all about! We finished with our waterfall photos and moved down the trail around twenty feet. We looked down and saw a herd of male bighorns staring up at us from the grassy driving range. Fourteen in all. As soon as the leader saw that we saw him, he led the herd on a run across the grass to gather at the waterfall's drainage where they were camouflaged by the desert terrain. They stood there and watched us hike into the jug handle arch canyon and back out and on around out of sight. The wash at the middle of this canyon leads directly up to the Jug Handle Arch on the ridge above. It would be a difficult but not impossible climb to reach it. After saying goodbye to the herd of bighorns, we rounded another side of the small mountain range and most of the golf course links came into view. There were very few V.I.P. golfers out on this cold morning. The Mother Trail could be seen across the way and today's break spot could be seen up ahead. When we stopped to point out the upcoming resting place, we were surprised to see our third bighorn sighting of the day. There were two males standing on the trail ahead of us staring across the canyon on our right. (See the photo to the right.) We got as close as we could before one of them turned his head and saw us coming. So, off they went. But, not before we got a pretty good photo! "Now, who's sneaking up on who?" By the time we reached the bighorns' original location, they were nowhere to be seen. They travel fast! The section of trail just prior to the snack spot saddle is the high point. Then, we reached the saddle and sat for a break behind the rocks to get out of the wind. 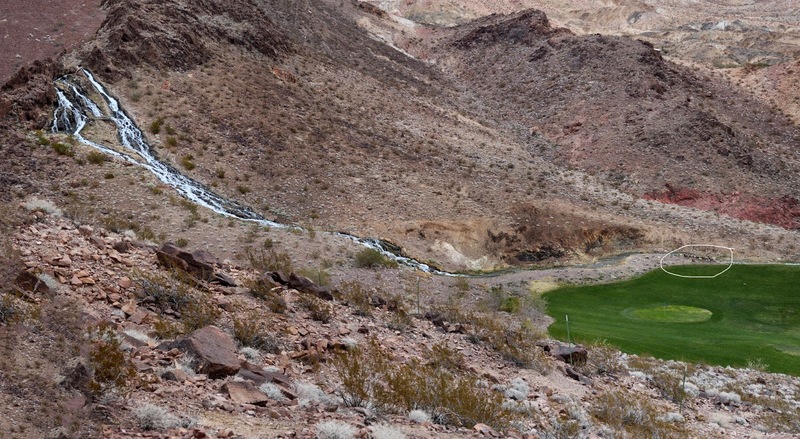 Our view was of the golf course below and Boulder City, NV beyond. After the break, we dropped down behind the saddle on a few small switchbacks as we preferred the "moderate" type of descent. Trail signs have been erected on these bike trails in Bootleg Canyon. They are very helpful and ... interesting. They advise which trails are moderate and which are more difficult. 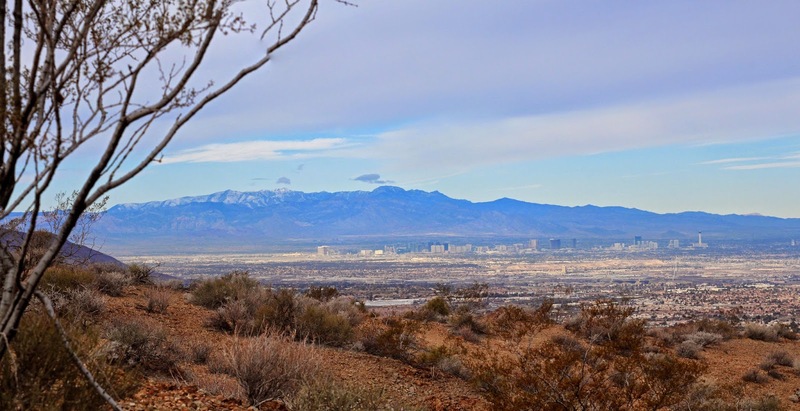 Soon, we began dropping into a small colorful canyon that offered distant views of the Las Vegas Strip and the Spring Mountains beyond. This area is used for illegal camping and a few homeless people can be found as well. But, we have never had any trouble, nor have we ever met anyone back here that was of questionable character. As we neared the completion of the loop, there is one more fork in the road. The left fork takes hikers up and across to the initial climb up junction. The right fork takes you on a more gentle descent back to the casino. We chose the right fork. Soon, we saw the casino and dropped down to cross the train tracks. The River Mountains Trail took us the rest of the way back to the cars. Fantastic hike for wildlife viewing today! 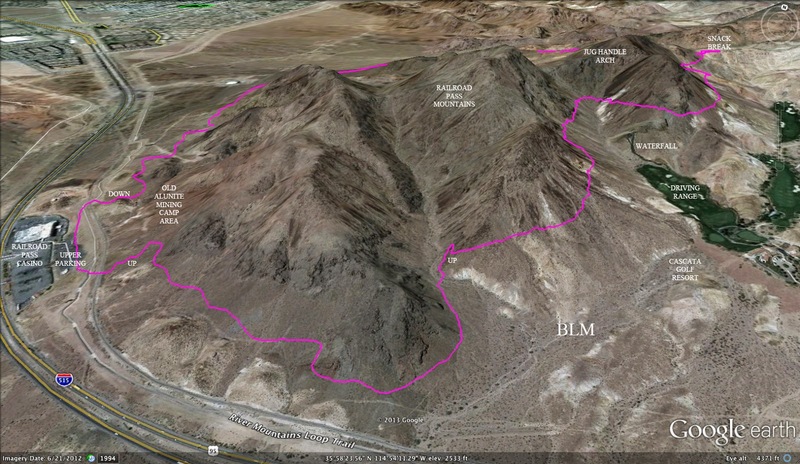 Hamblin Mountain is found in the Lake Mead NRA between Northshore Road at mile marker 18 and the lake. 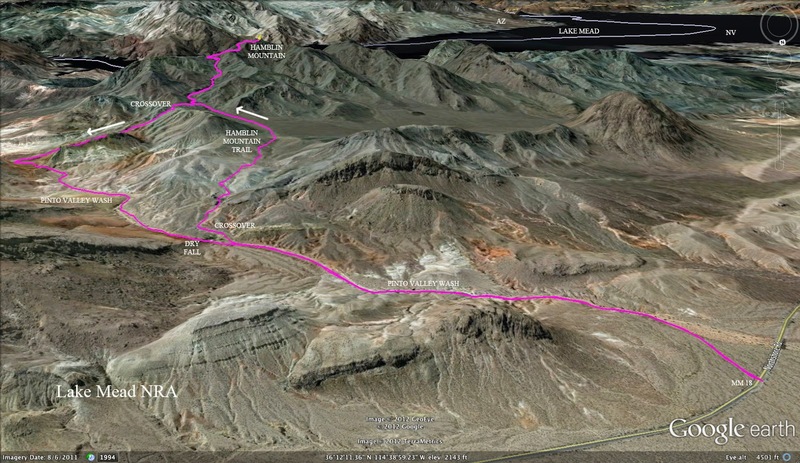 Seventeen hikers, (thirteen of whom had never set boots on Hamblin), showed up for the seven mile hike which includes a partial loop over to a colorful section of the old Arrowhead Highway which was the original road that ran between Los Angeles and Salt Lake City. We started up the wide wash and stopped for a small break at the base of the Cottonwood Springs dry fall. This is where the partial loop begins. We turned right onto a trail and quickly took the right fork that led into a small neighboring wash. 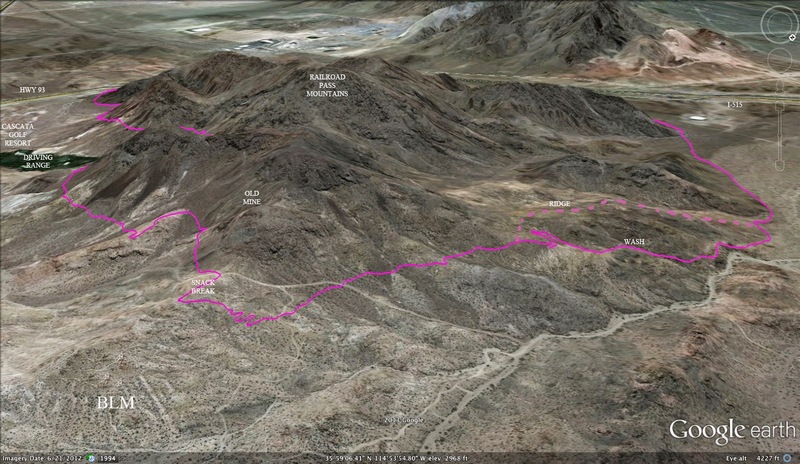 There are two suggested ways to get up to the intermediate saddle (the trail and the wash). We didn't take either of them! Yes, we missed the switchback on the trail and ended up too far to the left. Knowing our mistake, we worked our way back over to the right and eventually found the trail again just before the intermediate saddle. Following the trail again, we continued up to the wash on the left side of the large area of mountains in front of us. This wash narrows into a small canyon where we had to climb an eight foot dry fall. We wound our way up and up and up. Finally on the approach ridge, we felt the full effect of the annoying and very cold wind of today. With the exception of the writer (who wimped out) all the hikers determinedly continued their climb up to the peak. Many of the hikers then retreated back down to the wind shelter at the saddle for their break. Photos of the lake from the peak were not good due to the bright reflection off of the water. After enjoying the view of the lake in the cold, everyone began the descent. After dropping out of the small canyon, we junctioned with the cross trail that would take us over to that colorful wash.
We dropped down into the wash and followed the dry water way while taking in the amazing colors as seen in the second photo of this entry. At the end of this wash, we junctioned with the old highway and followed it down to Cottonwood Springs where we queued up for our turn at the drop challenge. From there, we retraced our earlier steps back to the cars. Chilly day but worth the effort. Everyone was in high spirits today as fifteen hikers showed up for a Merry Christmas Eve hike in the North Blue Diamond Hills of Red Rock Canyon NCA. We started at the Cowboy Trails parking lot and headed up to the upper stables where there were several horses being readied for their day's work. The guard dogs were also out doing their job! 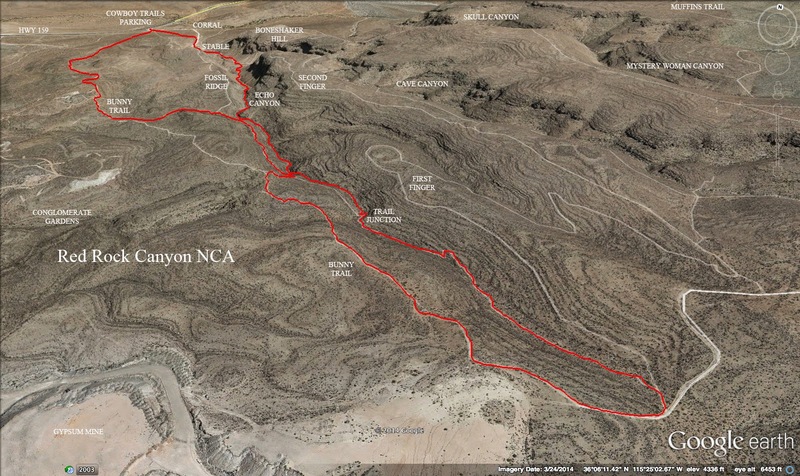 The Echo Canyon trail is found by dropping down behind the stables and climbing up to the two canyons beyond. Echo is the one on the right and soon, we found the trail that dips down into it. We hiked at a moderate pace as we climbed up the initial hill. Once we were up the first hill, moderate scrambling began. Not sure what the guys in the photo to the right were laughing at but perhaps we should say "bless you" to Sylvie! The weather was cool but there was no wind. The really bad weather comes in tonight in the form of high winds and rain or snow. Echo Canyon offers a decent trail for the most part. We stayed in the wash as much as we could. A couple of times, we needed to climb up to our left to circle around tough obstacles. Throughout the North Blue Diamond Hills, hikers can find many Pre-Cambrian (or seabed) fossils. There are a couple of very nice fossils found in the scramble shown at left. The top photo shows what we found on the wall that you climb up and on the wall that you pass by at the top in this location. 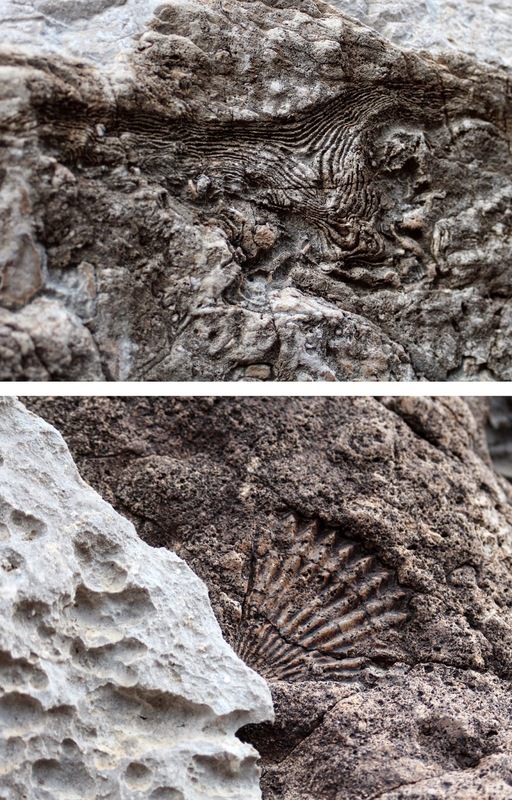 We found many other fossils here and there in the limestone underfoot and the conglomerate limestone that we passed by. About three-quarters of the way up the canyon, we junctioned with a trail. Turn right and you are on the Fossil Ridge Trail. Turn left, as we did, and you continue up to the top of Echo Canyon where we ate our snack. After the break, we turned right and right again to junction with what is known as the Bunny Trail. This trail is a surface trail that parallels the Fossil Ridge Trail. 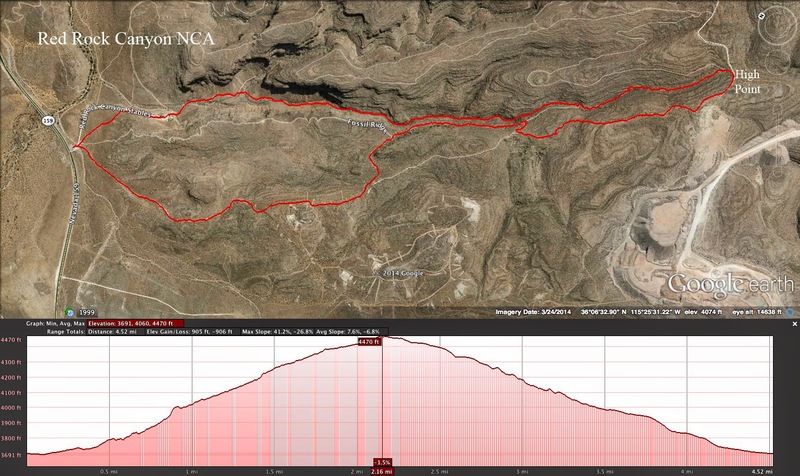 Around a half mile down the Bunny Trail, there is a trail junction that takes a very sharp turn to the right. 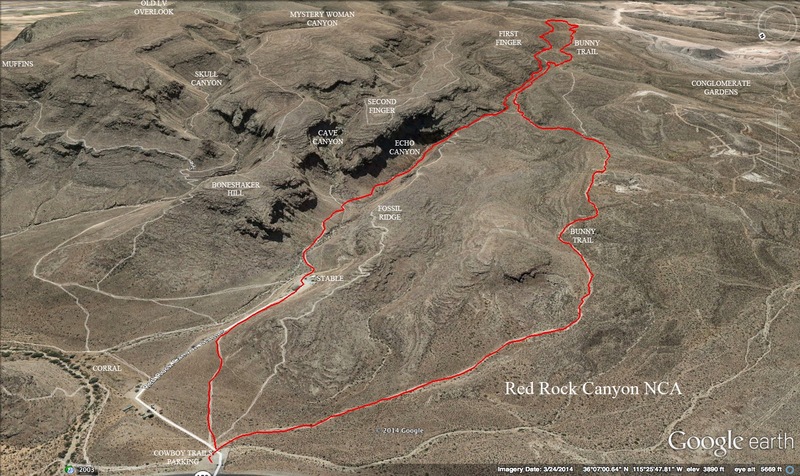 This connector trail takes you down to the Fossil Ridge Trail at a very photogenic area above Echo Canyon. We turned left onto that trail and enjoyed a hike down to the next junction. This part of the Fossil Ridge Trail is bordered with dark colored conglomerate rock with a far view of the Calico Hills. See the first photo of the entry. At the next junction, we opted to take another left turn to connect again with the more gentle Bunny Trail to return to the cars. Two of our hikers chose to turn right and take the steeper Fossil Ridge Trail down. We got to the cars first even though our route was slightly longer than theirs. Extremely pleasant hike today.